GTMS students are invited to the Holly Ball dance Friday, December 7 from 6:00pm until 8:00pm. Tickets are $5 and will be sold in advance and at the door. Pictures will be available for purchase: $1.00 unframed and $3.00 framed. Glow wear will also be for sale. Light refreshments will be provided. Please come dressed to impress to enjoy an evening of holiday fun. 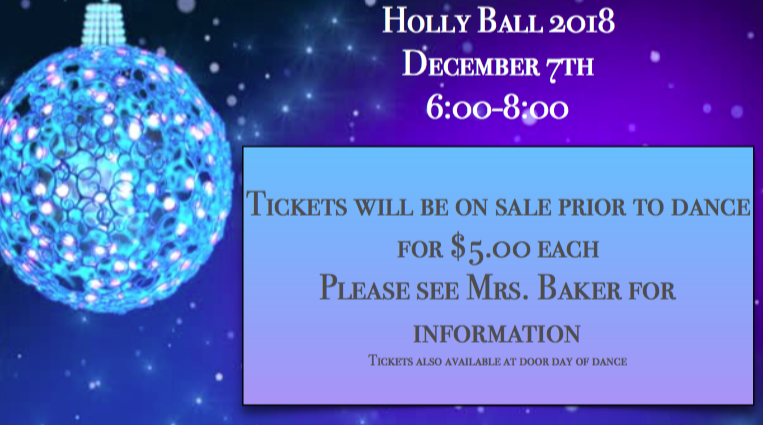 GTMS students are invited to the Holly Ball dance Friday, December 7 from 6:00pm until 8:00pm. Tickets are $5 and will be sold in advance and at the door. Pictures will be available for purchase: $1.00 unframed and $3.00 framed. Glow wear will also be for sale. Please come dressed to impress to enjoy an evening of holiday fun.